Panama City Beach is a coastal town filled with beachfront Florida hotels. The main street, Front Beach Road, is sprinkled with intimate affordable hotels and upscale beach resorts. No matter your budget beachfront hotels in Panama City make it easy to enjoy the soft white sand and crystal clear emerald green waters of the Gulf Coast. Panama City Beach is a little less formal than Destin, located just under an hour away. So if you want to kick back and enjoy the beach in an relaxed environment this main be the Florida beach town you have been searching for. If you are planning a spring break trip, there may not be a better location in Florida. Looking to avoid the party scene? Not to worry, families and couples alike enjoy this vacation destination the remainder of the year. You’ll even find a large amount of senior citizens enjoying the mild weather and affordable room rates in the winter. Panama City Beach and their beachfront hotels truly do offers a little something for everyone! Optimized for the best Florida beach vacation possible, the Holiday Inn Resort in Panama City Beach is a Polynesian inspired paradise, encased in Southern Hospitality. With a lush tropical landscaped pool deck with cascading waterfall, seasonal entertainment, hot tubs, game room, and water playground, guests will never run out of options for entertainment. The Holiday Inn is ideal for family vacations or business retreats, or maybe a little of both! Jammed packed with amenities, there is clearly not a better choice for a beachfront resort in Panama City Beach. Formerly the Sea Witch Motel, the Grand Cayman Motel may be Florida’s best value on the beach. Located beachfront on the west end of Panama City Beach, guests of the Grand Cayman enjoy the peace and relaxation of being away from the crowd, and the convenience of being only minutes away from the area’s top attractions. With off season rates starting at only $90 and peak season rates topping out at $190 a night for a two room efficiency, staying beachfront in Florida doesn’t always have to be costly. Be sure to reserve online for the lowest rates! 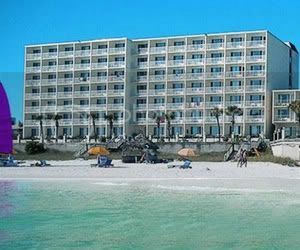 This beachfront Panama City Beach Hotel is a spring break hot spot and is located front and center on the strip. Although filled with young travelers in the spring, year round the Days Inn PCb is an affordable that offers beachfront hotel rooms and a selection of enticing amenities. 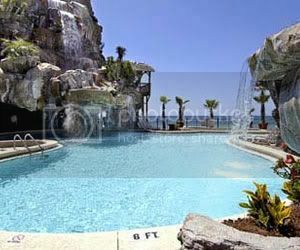 Adults and children alike will take delight in the beach-side lagoon pool, fully equipped with waterfalls and a grotto. Enjoy the close proximity to top attractions including Shipwreck Island and Pier Park. Finding a better value priced hotel on the beach anywhere in Florida will be a challenge. Reserve your room now!